Bacterial persisters are phenotypic variants that exhibit an impressive ability to tolerate antibiotics. 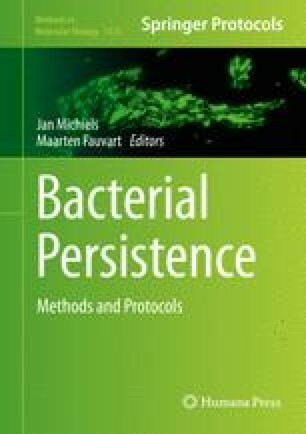 Persisters are hypothesized to cause relapse infections, and therefore, understanding their physiology may lead to novel therapeutics to treat recalcitrant infections. However, persisters have yet to be isolated due to their low abundance, transient nature, and similarity to the more highly abundant viable but non-culturable cells (VBNCs), resulting in limited knowledge of their phenotypic state. This technical hurdle has been addressed through the use of fluorescence-activated cell sorting (FACS) and quantification of persister levels in the resulting sorted fractions. These assays provide persister phenotype distributions, which can be compared to the phenotype distributions of the entire population, and can also be used to examine persister heterogeneity. Here, we describe two detailed protocols for analysis of persister physiology with FACS. One protocol assays the metabolic state of persisters using a fluorescent metabolic stain, whereas the other assays the growth state of persisters with use of a fluorescent protein. This work was supported by the Department of the Army under award number W81XWH-12-2-0138 and the National Institute of Allergy and Infectious Diseases of the National Institutes of Health under award number R21AI105342. The content is solely the responsibility of the authors and does not necessarily represent the official views of the funding agencies.